This application is made in accordance with the terms and conditions included with this form, see below. All entries must be returned by Friday 10th May 2019. To appear in our souvenir programme/social media, please supply us with information about your club/car. By signing the WHEELS ZONE & PARADE APPLICATION FORM every participant agrees to abide by the Terms & Conditions set out below. 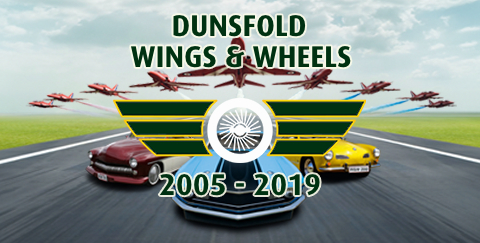 Dunsfold Park is an active airfield and for safety reasons all visitors (traders, contractors, exhibitors, public) must comply with on-site signage and directions given by Dunsfold Park and/ or Wings & Wheels staff at all times. Failure to comply is an arrestable offence under Article 73 of The Air Navigation Order 2005 and unauthorised entry to the operational area will result in immediate expulsion from the airfield and will be considered a breach of these Terms and Conditions. Please refer to the Wings & Wheels site procedures and access map for further information. Every person admitted to the event must be in possession of a ticket/wristband issued by the organisers. Any person not in possession of a ticket/wristband will be refused entry and will be directed to a Box Office. Your participation in the Wheels Zone Parade is appreciated. It is a valuable addition to Wings & Wheels, however it is subject to good weather and ground conditions on the day and therefore may need to be cancelled at short notice. Participant numbers are limited and will be allocated according to vehicle suitability and the successful applicants notified prior to the Show. Priority will be given to early applicants. The Wheels Zone Parade is generally run under the same rules as the MSA and ACU rules for vehicle parades. Full details and regulations will be issued upon acceptance to the Parade. The crowd line parade is entered at your own risk. The Organisers will not be held liable for any damage to vehicles. All participants are required to restrict their speed to 15mph. No overtaking. Information boards regarding the club and vehicles should be displayed on the Exhibition Stand. The Wheels Zone is situated on a grass arena and therefore you enter this arena at your own risk. Spaces will be allocated in advance; please only use the pitch which is allocated to your Club. Please adhere to the requests of marshals and parking assistants. Barbeques and fires are not permitted. No dogs will be admitted, except for official assistance dogs. Wheels Zone Parade participants must display vehicle passes clearly (photocopies will not be accepted) and be in possession of their entrance tickets/wristbands. Participants to the Wheels Zone Parade without either a valid vehicle pass or ticket/wristband will not be permitted entry and will be asked to park in the public car park. No support vehicles will be permitted to park in the main Wheels Zone. Support vehicles will be asked to park in the public car parks. Wheels Zone Exhibits may be left on-site overnight. This is done at the Wheels Zone Exhibitor's risk. The Organisers take no responsibility for any damage, theft or loss of any exhibits, vehicles or belongings. Wheels Zone Exhibitors shall ensure their pitches are manned continuously during the show. The Wheels Zone Exhibitor agrees to keep all promotional activity to their allotted space and is not permitted to distribute printed matter or materials of any nature within the Event arena or at entrances to the showground. The Organisers reserve the right to cancel any applications which they feel do not meet the high standards of presentation to be achieved throughout the Event. The Organisers have the right to request detailed plans or quality photos of the proposed Wheels Zone Exhibition. Although there will be a security presence within the site, all vehicles and items are left on site at the owner's risk. All participants are asked to ensure that their site and immediate area be free from litter and refuse. We thank you for your co-operation in this as litter is a danger to aircraft. Bookings will only be accepted by completing, in full, the above booking form. Entries close on Friday 10th May 2019. Any entries after this date will not be accepted. The Organisers reserve the right to select the most appropriate vehicles for the parade runs but priority will be given to early applicants.